Taylored Expressions Die Focus: Band It 2! Hello! I wanted to share a recent thank you card I made using some fab products from Taylored Expressions! I haven't used this gorgeous silhouette from Discover Your Wings in a while and it's one of my favorites:) I inked it up with Memento Rich Cocoa ink and cut it out with the coordinating Discover Your Wings-Flowers Die. I then layered it over some Salt Water Taffy dp that I embossed with the new Cloudy Days EF. I also added a butterfly from the same set in the corner. 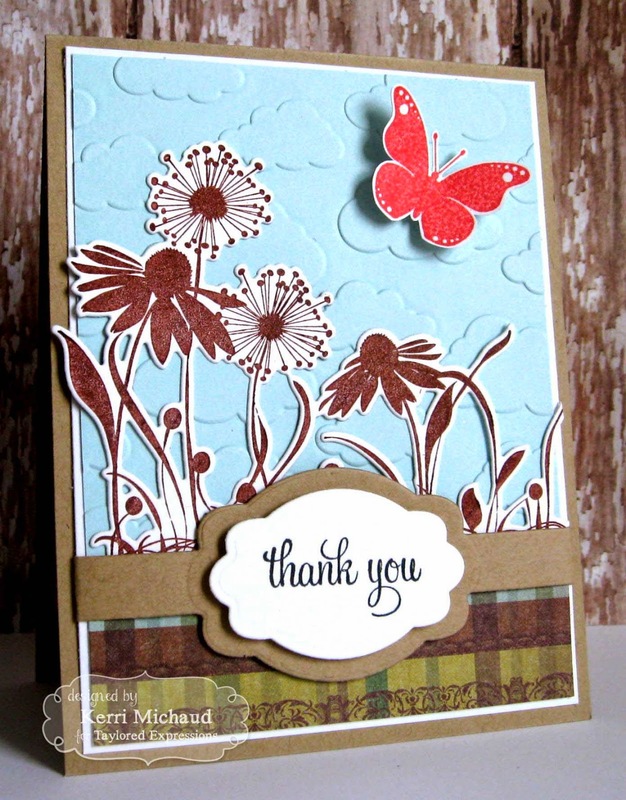 Finally, I used the awesome Band It 2 Die for the sentiment which comes from the Wispy Wishes stamp set. Well I will be spending today through Sunday at Disney World of Sports working at the gymnastics meet that my daughter's gym hosts every year. Should be fun! Avery competes on Sunday and I'm praying she has a great meet! She needs a confidence boost:) Thanks for stopping by and have a fab Friday!